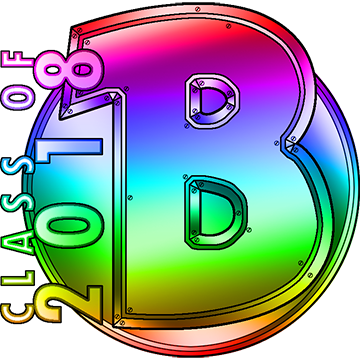 In Season 16, most of (but not all of) the sets – for nearly every class – had been improved. That made it difficult for me to decide which class to play. My solution to this problem was simple. 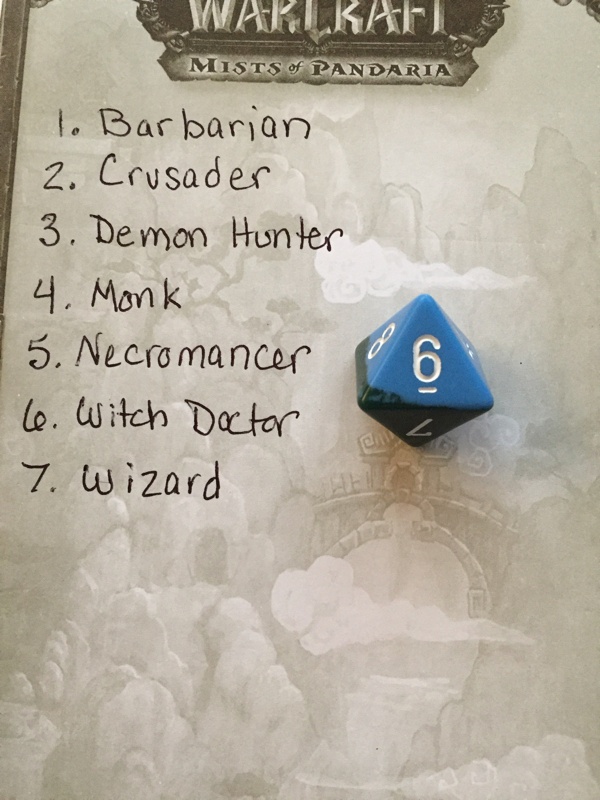 I put all the character classes in alphabetical order and rolled an 8-sided die. My first roll was an 8, so I rolled again. I got a 6 on my second attempt, which means I would play a Witch Doctor in Season 16. The Challenge Rift that was available to do at the start of Season 16 was difficult for me. I wasn’t really expecting that because I watched an informative video made by Leviathan that showed me exactly where to find the big monsters. The problem was that I have rheumatoid arthritis in my hands, and it slowed me down. My fingers wanted to lock up, and that severely reduced my dexterity and button-hitting speed. Fortunately, Sixtee (from the Shattered Soulstone clan) helped me out. 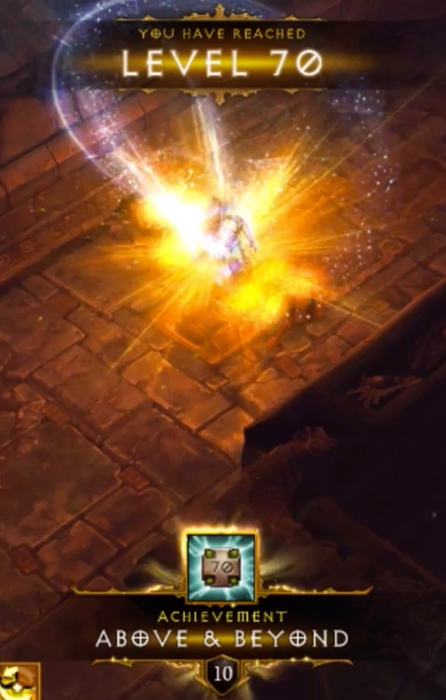 We finished the Monk Challenge Rift at 6:20.033. 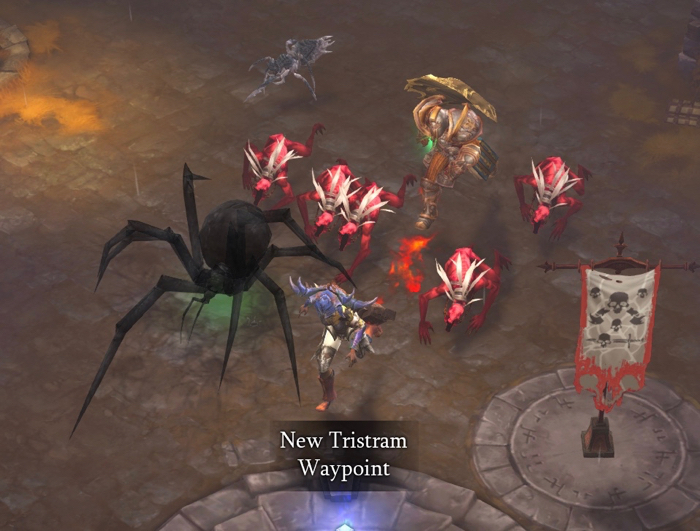 Season 16 started in January, which meant that The Darkening of Tristram event was happening. Just for fun, I decided to run my new Witch Doctor through it. The next time I played was when I went into the game specifically to allow someone to join the Shattered Soulstone Clan. I decided to stick around and pick off some of the “leftover” Chapter I objectives that I needed to finish. I was asked, by the people on the Shattered Soulstone Discord, if I wanted to join a group. I declined because my hands weren’t quite ready for that at the time. Instead, I hung out in the Discord chat and talked with people while playing solo. 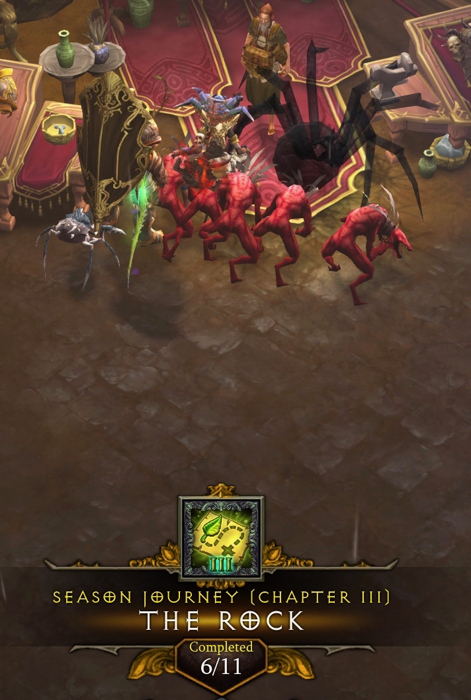 My Witch Doctor, the Templar, and a bunch of minions killed Belial on Hard difficulty and completed the “Two Minds” objective. Another Chapter I objective required me to kill Ghom. I did this on Hard difficulty. This gave me just enough XP (experience points) to hit Level 35. Ghom just so happened to be a part of a Bounty, which was convenient. 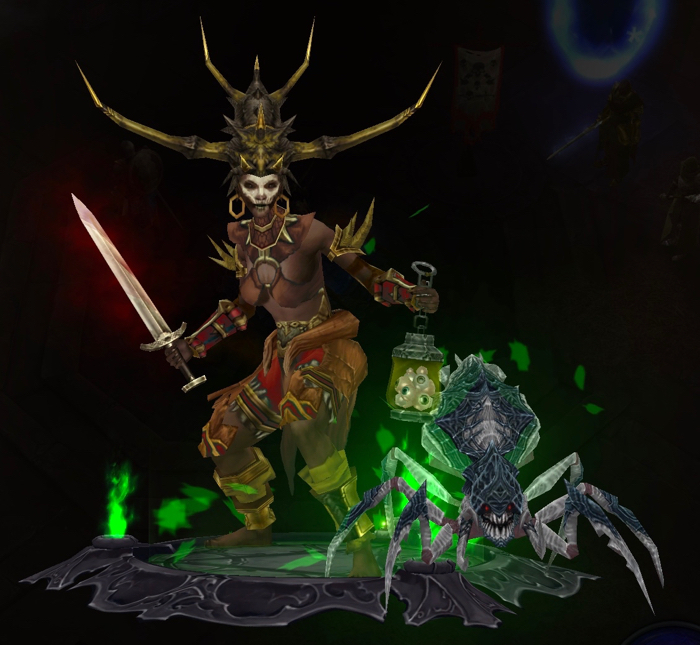 Here’s what my Witch Doctor was wearing when she was Level 41. In the video above, I worked on completing the last Objective in Chapter I. My Witch Doctor was at Level 48, and needed to hit Level 50. I moved the difficulty up to Expert. I decided to be efficient and get XP from Bounties. (The Bounties are required for upcoming Chapters). 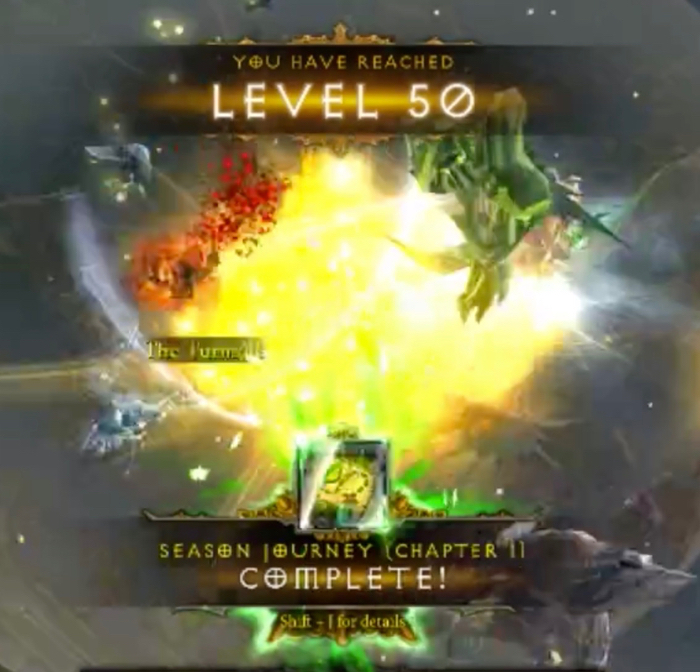 My goal while streaming that day was to hit Level 50. It was the last thing I needed to do to finish Chapter I of the Season Journey. My next goal was to work on Chapter II of the Season Journey. There are a total of eleven Objectives, and I only had one of them completed. It was the Friends With Benefits Objective, which players earn when they fully equip one of their followers. 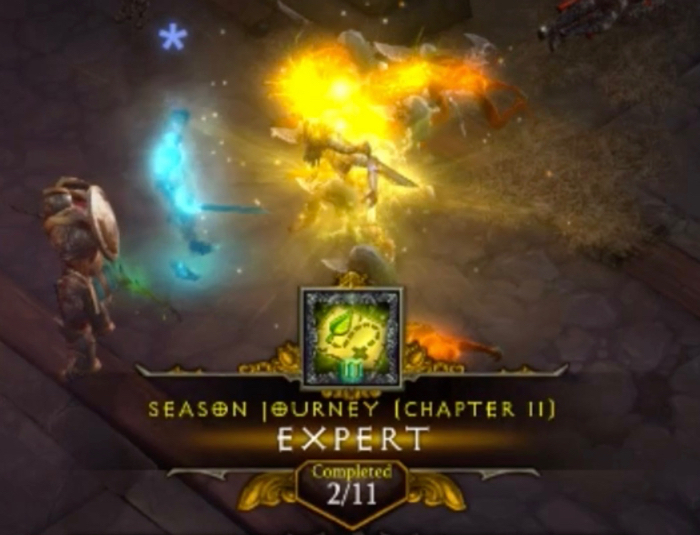 Expert: Complete a Nephalem Rift on Expert difficulty or higher. 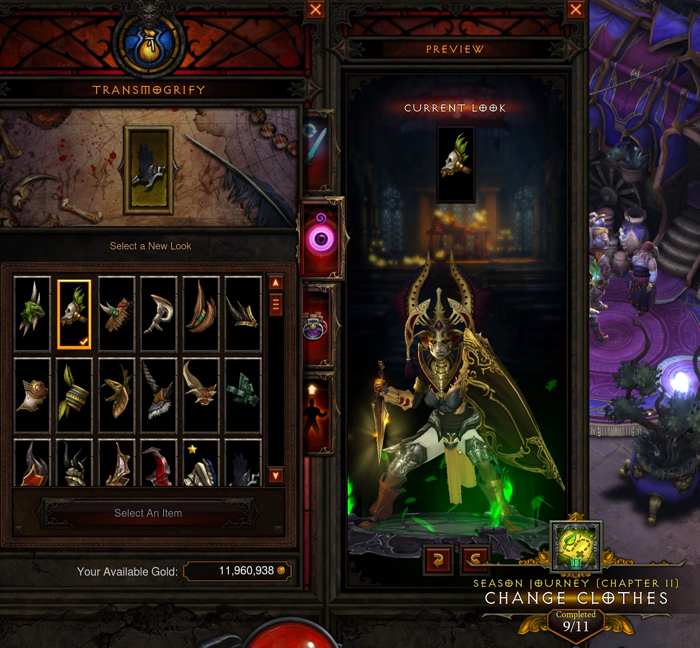 Here is what my Witch Doctor was wearing at Level 51. A friend that I play Dungeons & Dragons with (Synrgy) was ready to play some Diablo III, and wanted to help me level up. We had been trying to find time to play D3 together for a long time, and finally made that work. The first thing I needed to do was leave my game (which was on Expert difficulty) and change the difficulty to as high as the game would let me go. That limit turned out to be Torment IV. 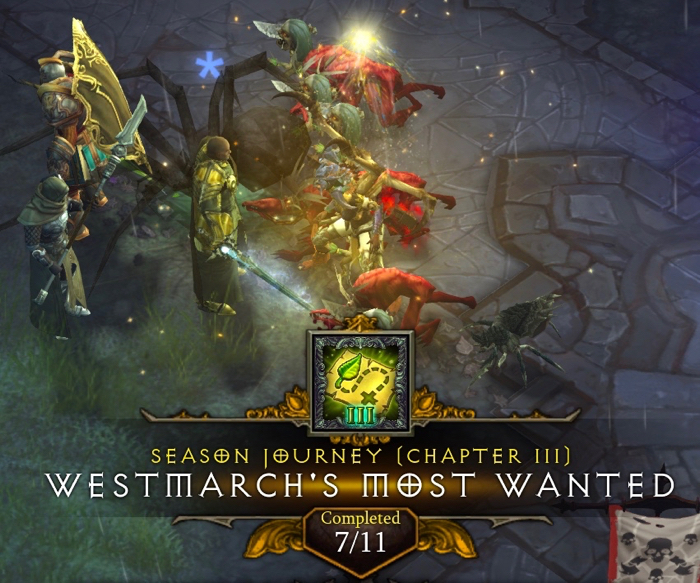 Master: Complete a Nephalem Rift on Master difficulty or higher. In the video above, Synrgy and I went to The Ruins of Sescheron so I could get Kanai’s Cube and complete at Chapter II Objective. I hit Level 57 shortly after we began running through Sesecheron. 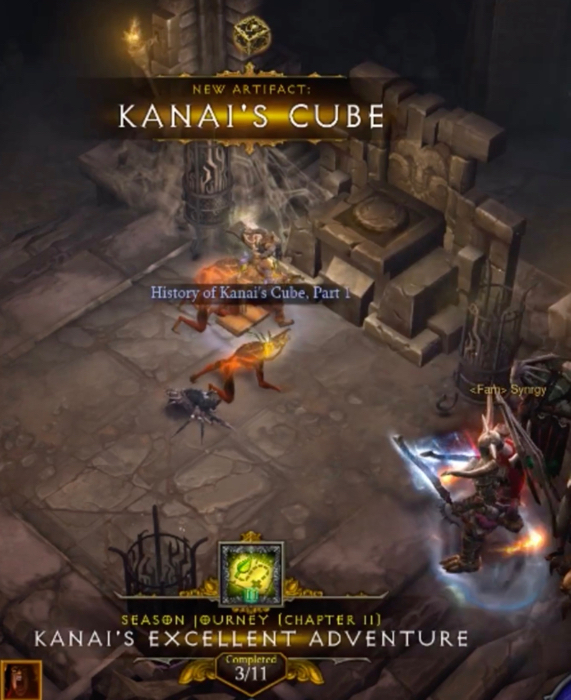 By the time we found Kanai’s Cube, I was Level 63. This went very quickly! 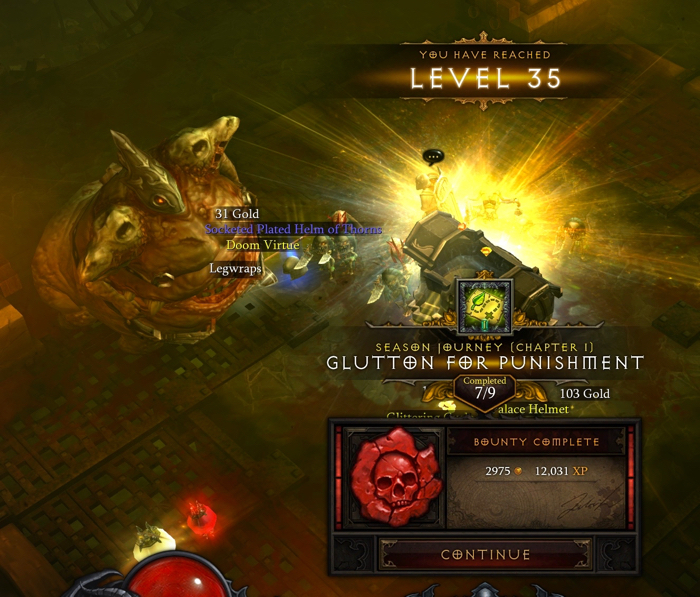 We did another Nephalem Rift, and I hit Level 66 when we turned it in. 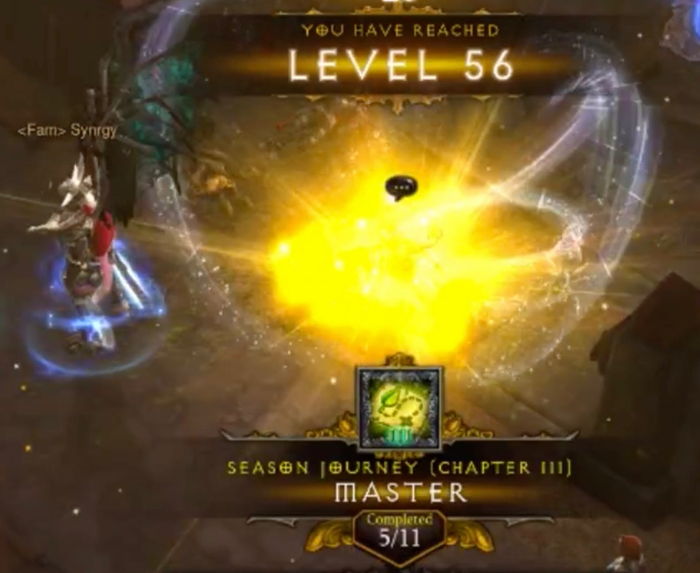 I hit Level 68 in the next Nephalem Rift, after Synrgy killed the Rift Boss. After that, we stayed in the Rift and he killed random monsters until I hit Level 70. It went much faster than if I had played solo. 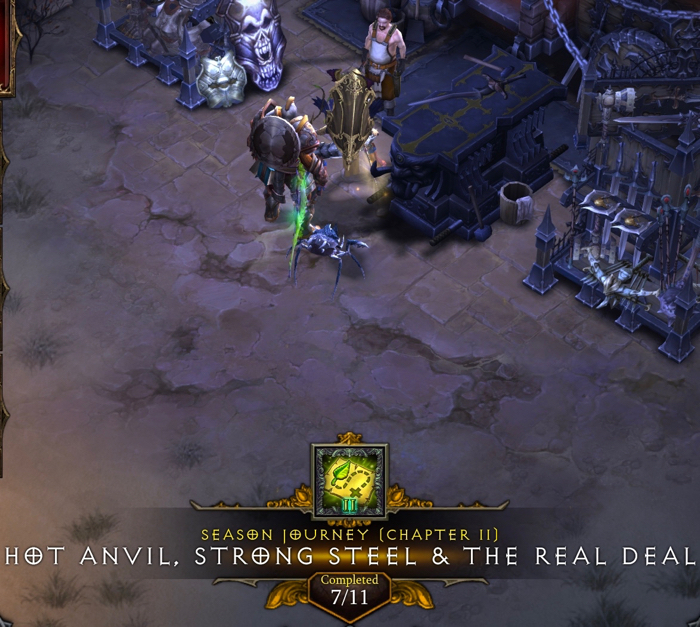 I got my first set piece in the last level of the Nephalem Rift that we explored. It was Zunimasa’s Cloth. 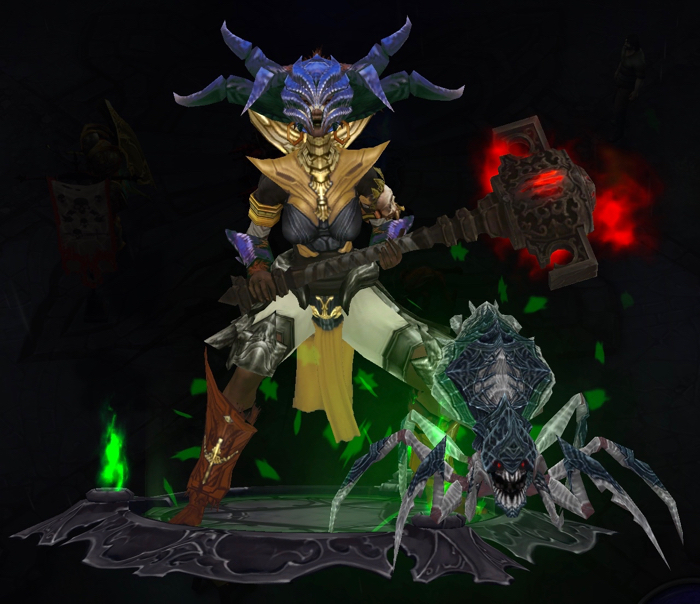 The “free set” in Season 16 (for Witch Doctors) is the Arachyr’s set. Having pieces of Zunimasa’s set is useful, though, if I decided to do more than one Set Dungeon. 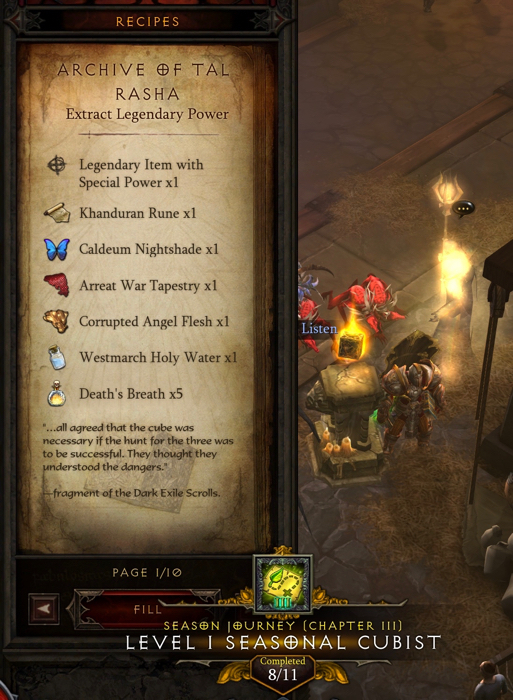 By the time we decided we were done with this Nephalem Rift, my Witch Doctor was at Level 70 and had 4 Paragon points. Towards the end of the video above, we ended up with a full party. Synrgy and I were joined by theartguy (who I also play Dungeons & Dragons with) and someone else who was new to me. 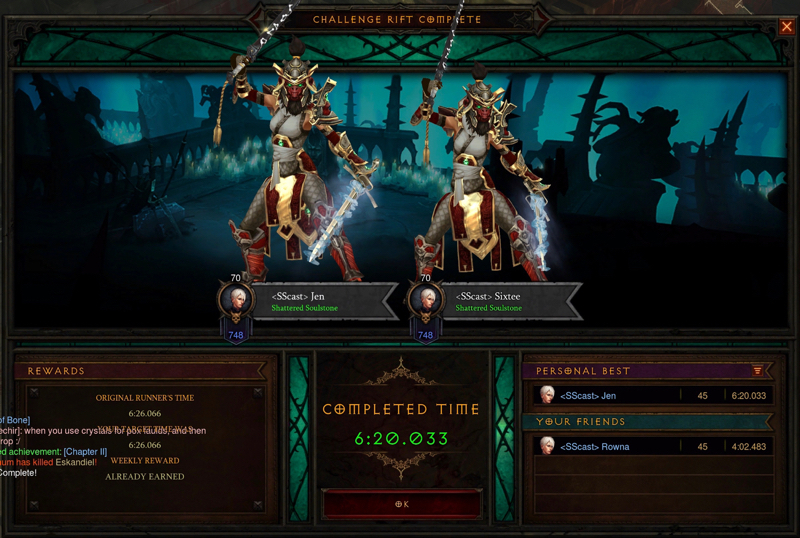 We ran a Nephalem Rift together. I hit Paragon 5 the instant I jumped into the Rift. When we turned it in, I hit Paragon 24. My Witch Doctor got a Carnevil Voodoo Mask in that Nephalem Rift. 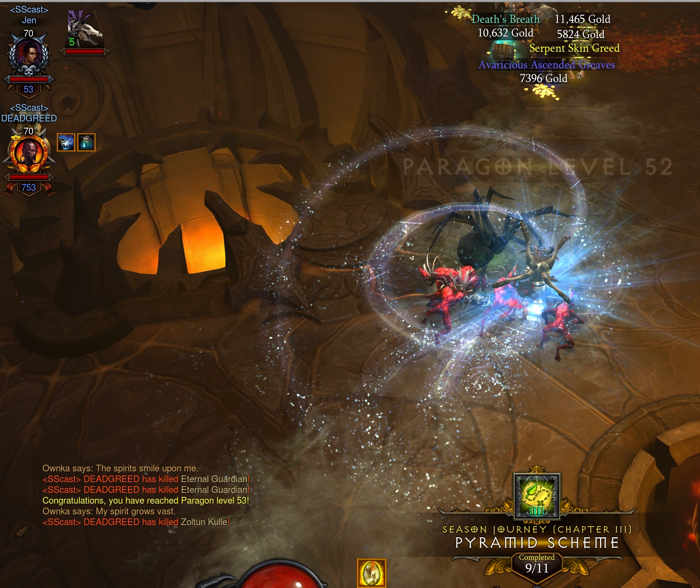 The last Nephalem Rift we completed put me at Paragon 35. 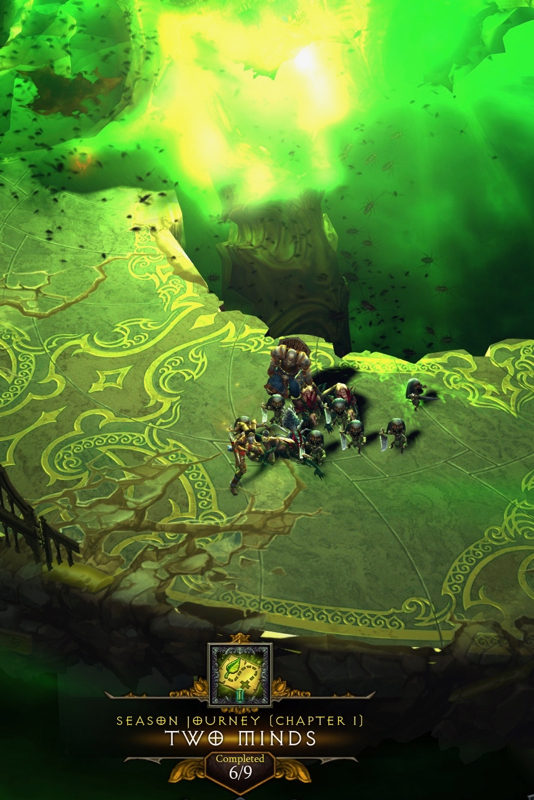 In the video above, my friend theartguy and I ran some Greater Rifts. After turning in the Greater Rift, I was at Paragon 42. Making progress! 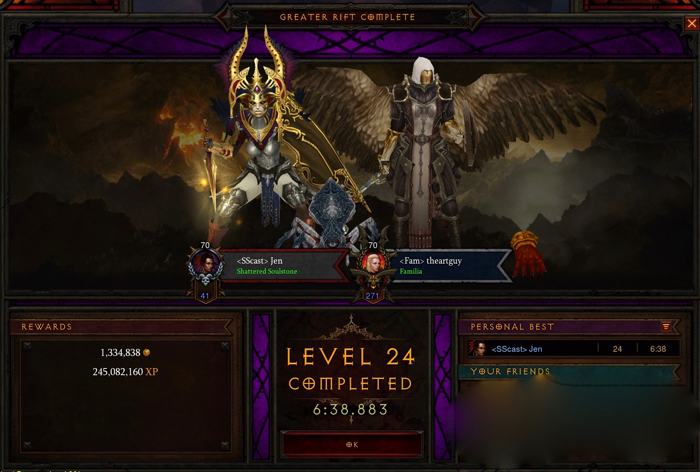 We decided to do another Greater Rift 24, since the first one worked out really well. The second time was successful, but took a but longer than the first one we did. 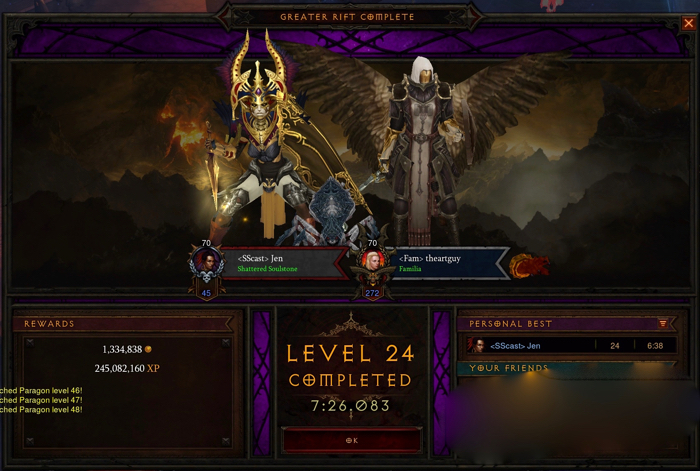 This time, we finished Greater Rift 24 at 7:26.083. I ended up at Paragon 48. At this point, the majority of what I needed to do in order to complete Chapter II involved crafting. I worked on it while hanging out in the Shattered Soulstone Discord and talking with people. Maximum Efficiency: Raise the Blacksmith, Jeweler, and Mystic to level 12. The Little Things That Count: Craft a level 70 item at the Jeweler. Hot Anvil Strong Steel & the Real Deal: Craft a level 70 item at the Blacksmith. 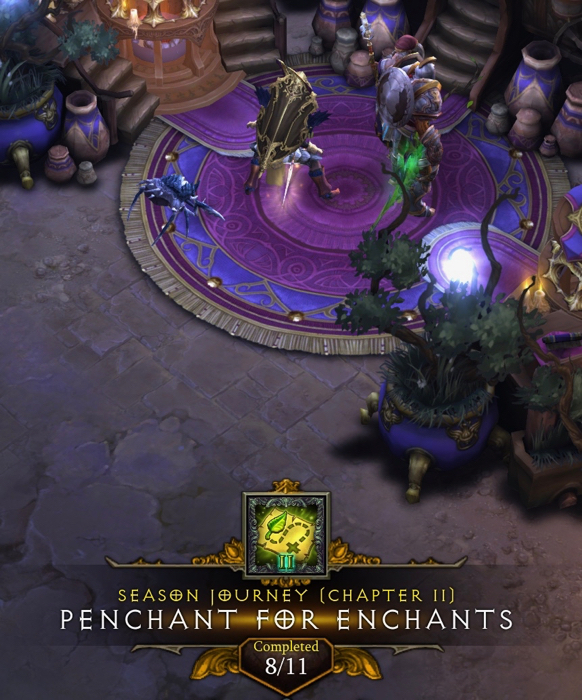 Penchant for Enchants: Replace a property on an item with Enchanting at the Mystic. Enchanting is very useful for replacing an unwanted primary affix on a near-perfect item. 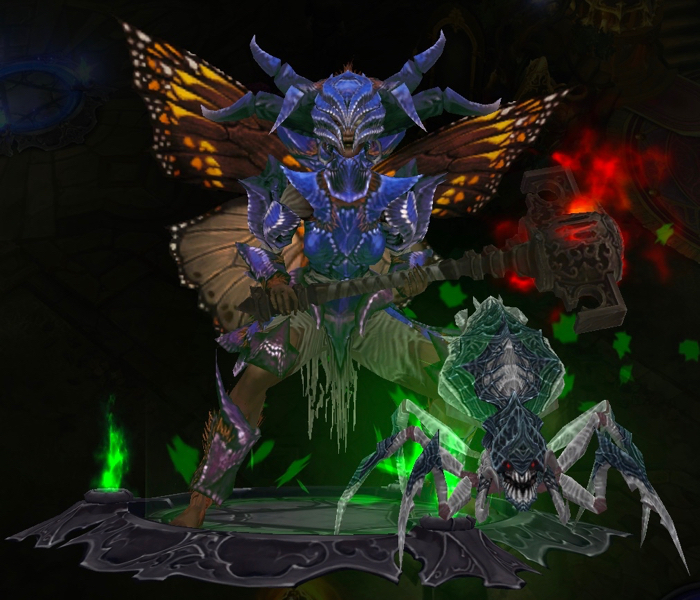 Pay No Mind: Kill Queen Araneae at Level 60 or higher on Hard difficulty. With some help, I was able to complete Chapter II in Season 16. Completing Chapter II gave me the Helm and Gloves of the Arachyr’s set. It is the “free” set for Witch Doctors in Season 16. 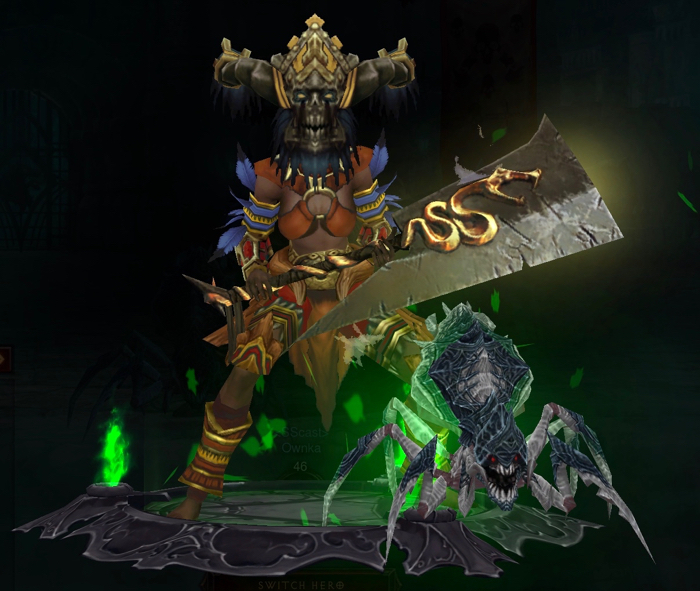 Last time I played a Witch Doctor, I used the Zunimassa’s set, and have never tried Arachyr’s. My Witch Doctor is holding a two-handed mace called The Furnace. It isn’t specifically a Witch Doctor weapon, but was better than anything else I had at the time. I like the way it looks. Now seemed like a good time to start using the giant spider minion. Hey There Kadala: Spend Blood Shards at Kadala. Kadala has a 10% chance to give you a Legendary. Chapter III has 11 objectives. I had already completed five of them. It was a good start, but there was more work to be done. The Rock: Craft a Gem of Imperial or greater quality at the Jeweler. Socketing an Emerald into your weapon increases your Critical Hit Damage and is a big damage boost. Deadgreed helped me kill Zoltun Kulle on Torment XIII. Deadgreed also helped me kill Rakanoth on Torment XIII. The objectives only require this to be done on Master difficulty – but count if you do it on higher difficulties. 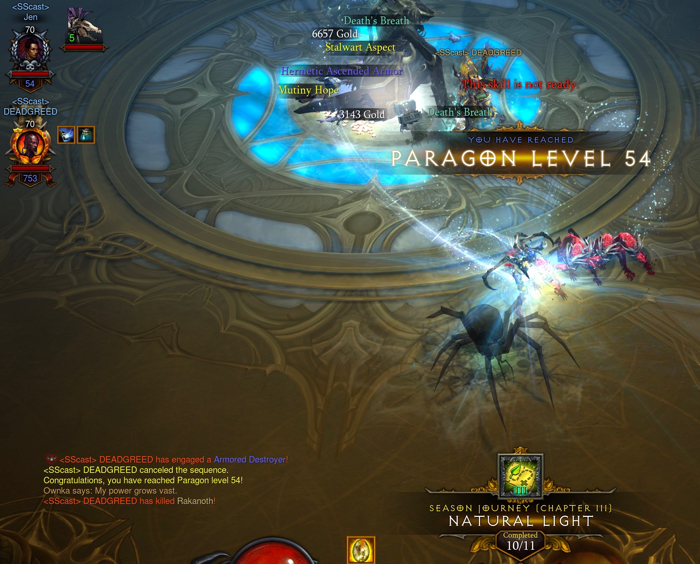 We completed a Greater Rift Level 70 at 8:25.116. When we were done, I had 149 Paragon points. The last thing I needed to do for Chapter III was complete a set of Act IV bounties. I got help with that from Deadgreed and Ritzey. In past Seasons, I usually finished Bounties solo. I don’t mind doing them, but it seems like a lot of people hate Bounties. I learned that if you get into a group, it goes a lot faster. For example, in a four person group, each player picks a Bounty to complete by themselves. Everyone helps on the remaining Bounty. Everyone completes the Seasonal objective for that Act’s Bounty and gets a cache. In this case, however, I was being “carried”. The guys were a lot higher Paragon than I was, and we were playing on Torment XIII. The most I could do was try not to die. I appreciate the help! Heaven’s Most Wanted: Obtain an Act IV bounty cache. 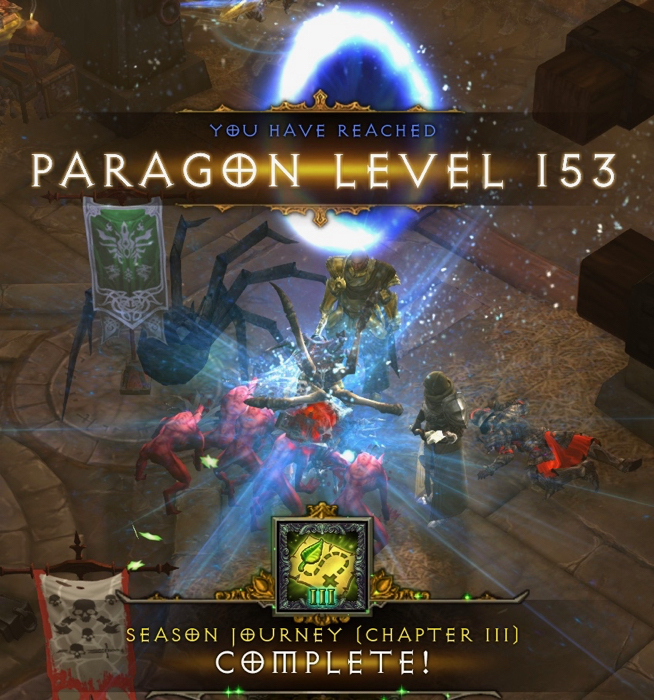 I completed Chapter III at Paragon Level 153 – thanks to help from friends. Players that complete Chapter III receive two more pieces of the “freebie set”. What you get depends on what character class opened Haedrig’s Gift. 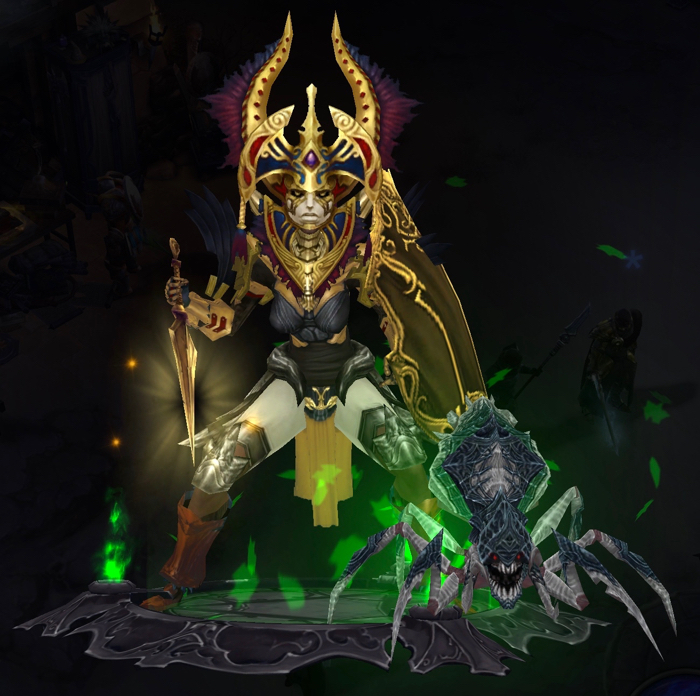 I’m playing a Witch Doctor, so I got more Arachyr’s set pieces. 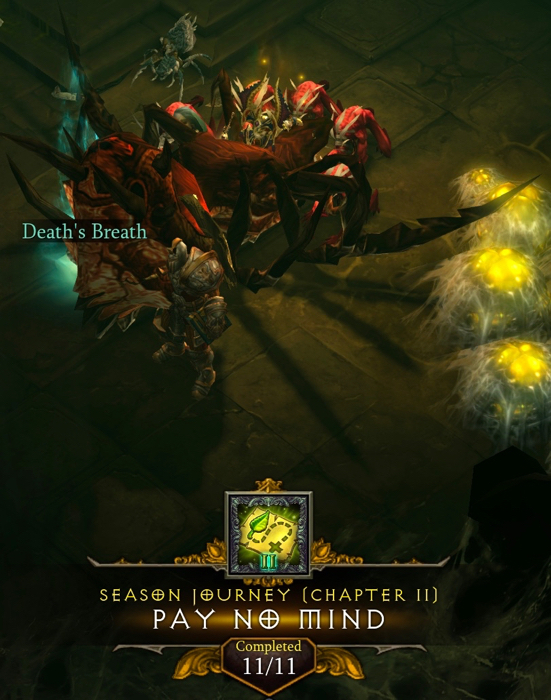 Chapter IV requires players to kill all four Keywardens on Torment IV (or higher). My Witch Doctor wasn’t quite ready for that on her own. Fortunately, Deadgreed and Ritzey helped me out. They also helped me kill The Skeleton King and Clydaea. Players had to kill them on Torment VII or higher. 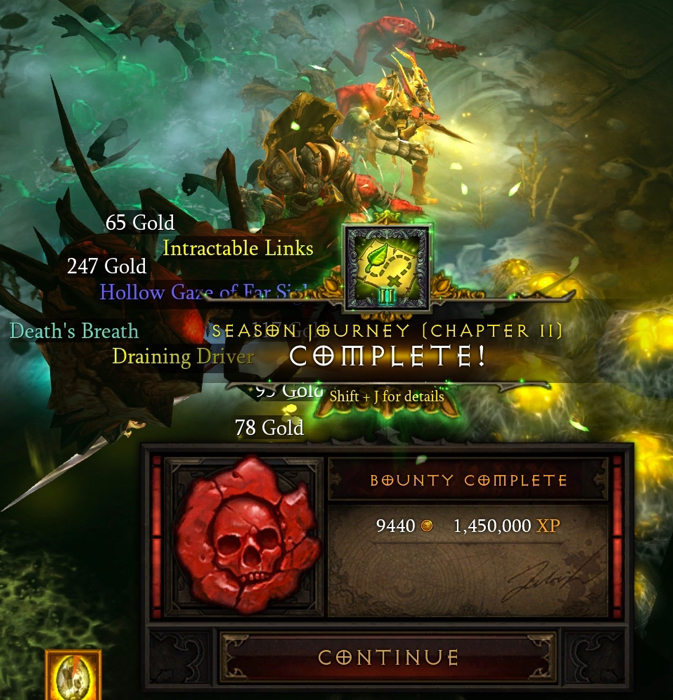 At some point, I completed a Torment I Nephalem Rift – probably with help. Most of what was left for me to do in Chapter IV involved crafting. 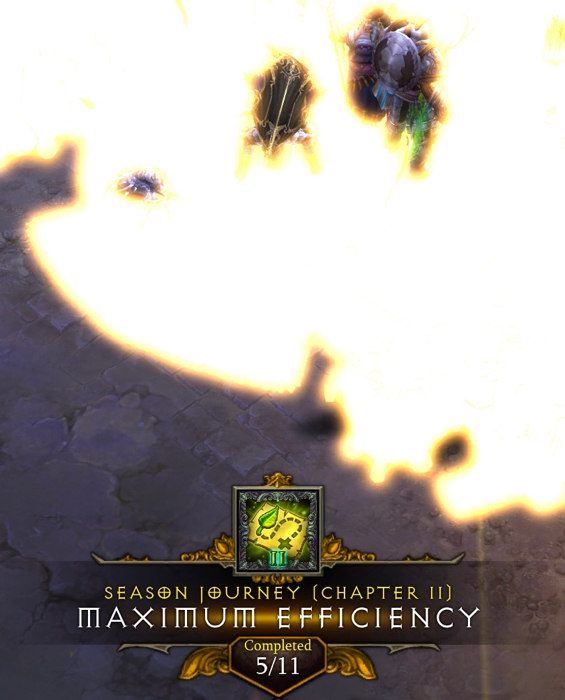 The last thing I needed to do to complete Chapter IV, and earn the Wings of Lempo, was to complete a Greater Rift 20 solo. 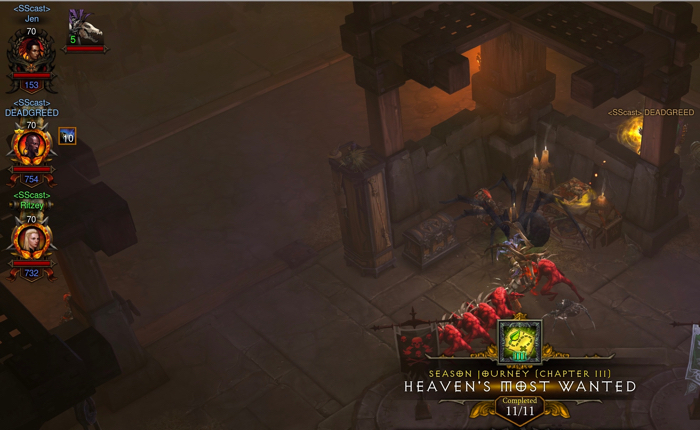 In the video above, I ran a Nephalem Rift in order to get a Greater Rift key. 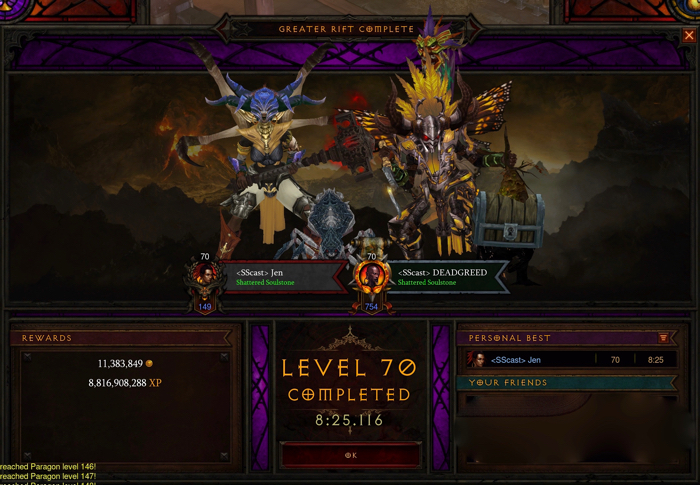 Then, I ran a Greater Rift 20, even though I wasn’t quite sure my Witch Doctor was geared up enough for that. To my surprise, it only took one try to finish a Greater Rift 20! I have now, officially, completed Chapter IV of the Season Journey. 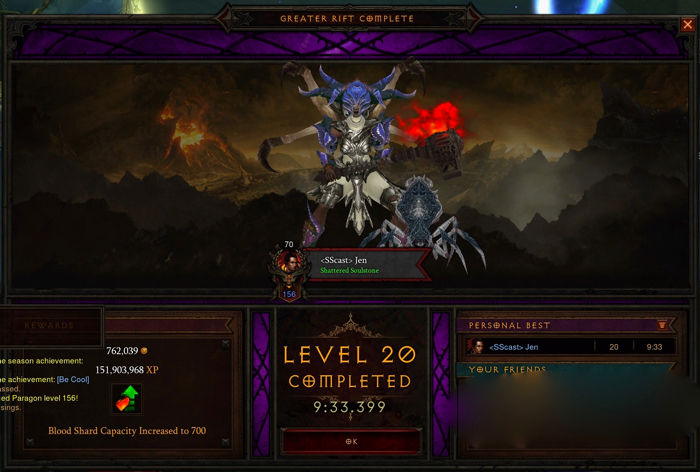 I completed Greater Rift Level 20 at 9:33.399. 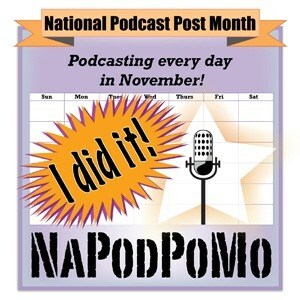 My goal for Season 16 was to get the Wings of Lempo. I like the contrast between the orange wings and the blue Araychr’s set. What’s next? 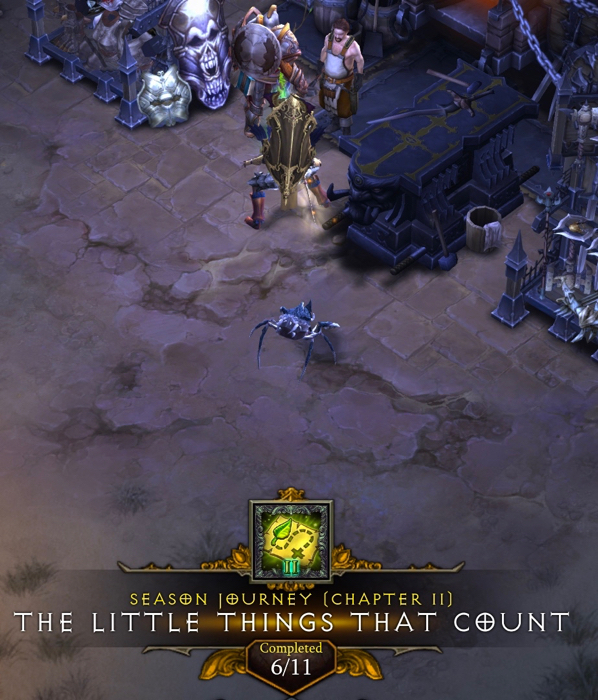 My new goal is to complete enough of the Season Journey to earn more Stash space. If I achieve that, I’ll put the highlights into another blog post. Highlights from Season 16 (Season of Grandeur) is a post written by Jen Thorpe on Book of Jen and is not allowed to be copied to other sites.